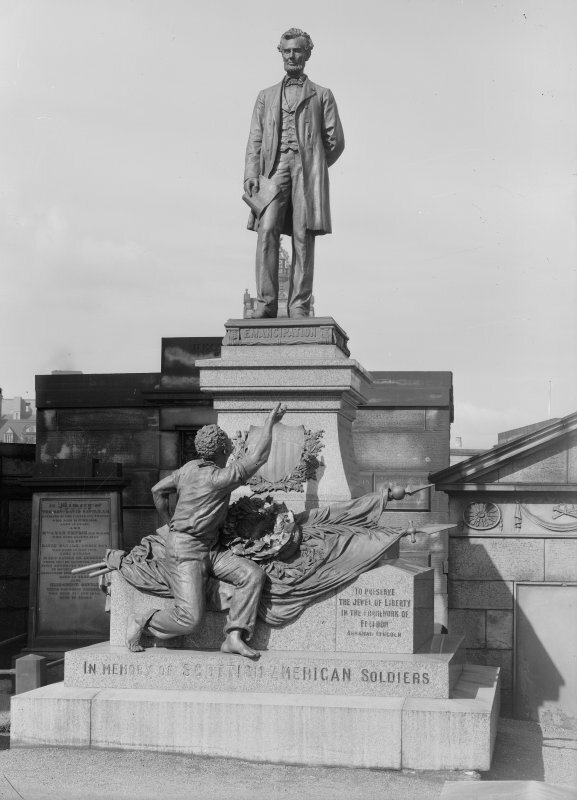 General view of American Civil War Memorial in Old Burial Ground on Waterloo Place. 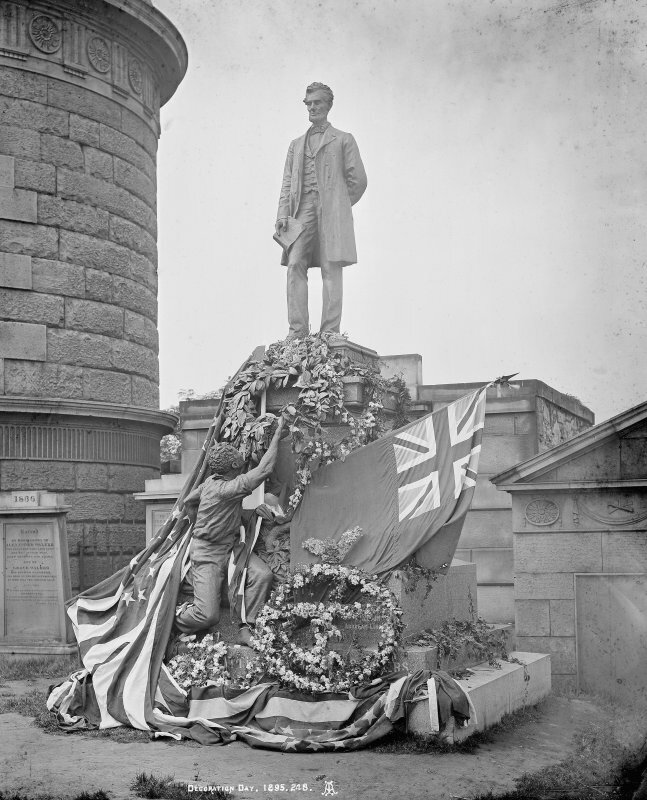 General view of American Civil War Memorial in Old Burial Ground in Waterloo Place with wreaths and floral tribute to "Lincoln". Insc. "In the Old Calton Burying Ground, Edinburgh. 228. AI." 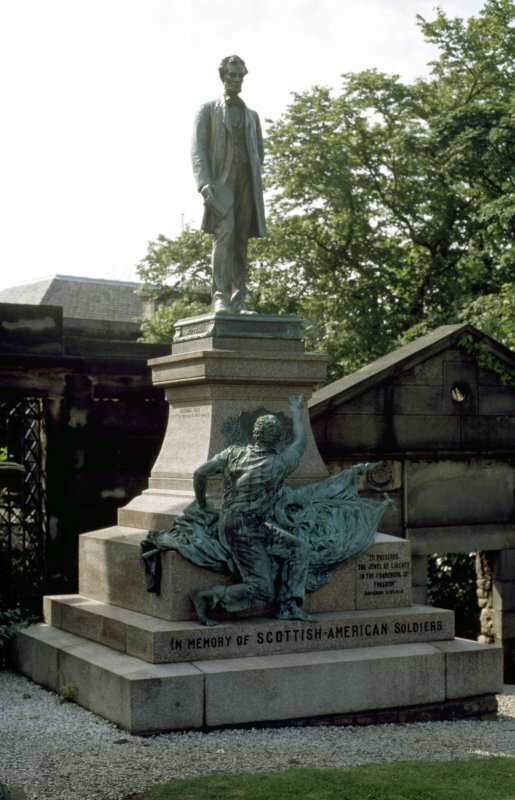 General view of American Civil War Memorial in Old Calton Burial Ground on Waterloo Place, Edinburgh. 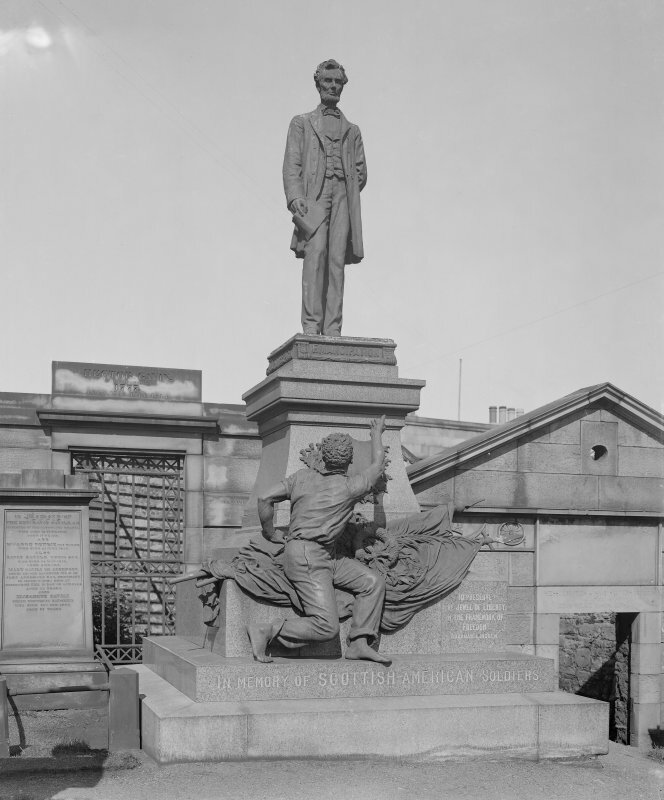 A bronze life-sized figure of a slave, resting on furled battle flags at the base of a red granite pedestal, holds up his right hand in gratitude to a bronze life-sized statue of Abraham Lincoln which surmounts the pedestal. Lincoln stands with his right knee slightly bent, his left hand behind his back, and holds the proclamation of emancipation in his right hand. On the east face of the pedestal below him is a bronze shield decorated with the American and British flags, flanked by thistles (left) and cotton (right). 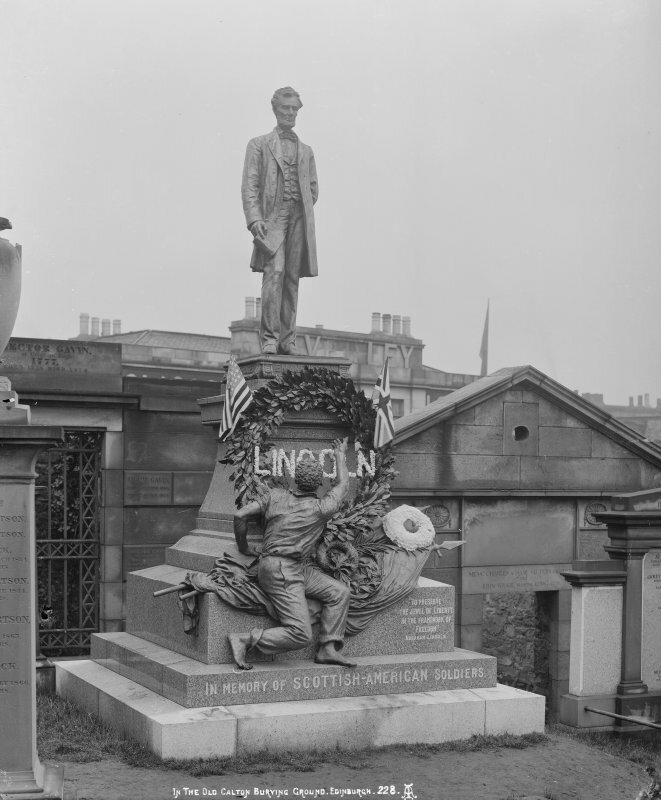 The monument commemorates Abraham Lincoln and is on the burial plot for the Scots who fought in the American Civil War. This plot was provided by Edinburgh Town Council on 1 September 1892, following a request from the American Consul Wallace Bruce. 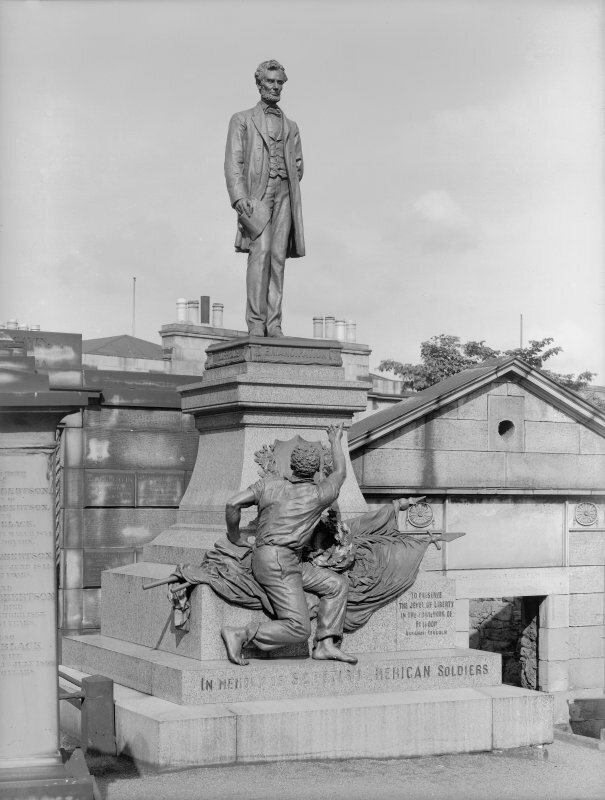 Bruce, a graduate of Yale University, had fought in the American Civil War and it was he who had the idea of erecting a statue of Abraham Lincoln. As early as November 1890 Andrew Carnegie offered £200 towards the cost. The statue was to be a gift from America to Scotland. 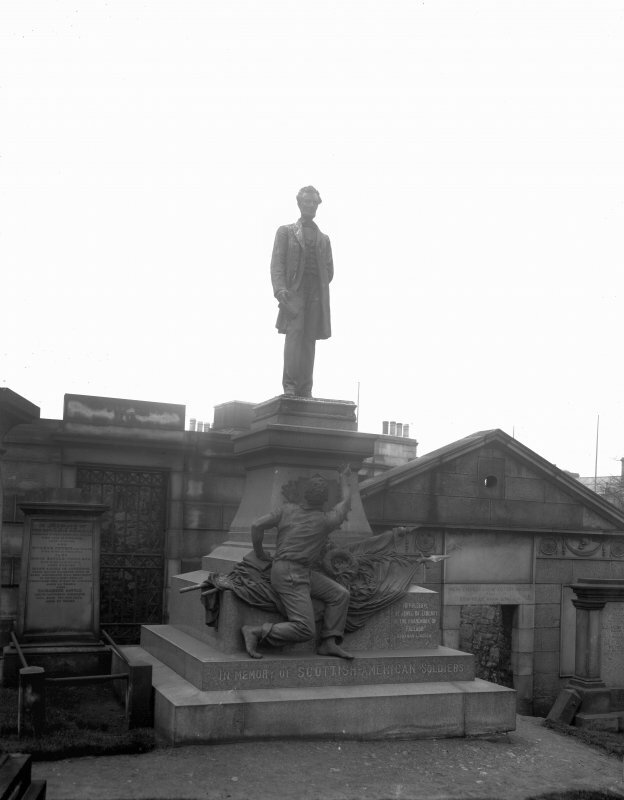 The monument was unveiled on 21 August 1893. Alexander Smith's name, on the south face of the pedestal, was added in 1993 when the monument was rededicated. IN MEMORY OF SCOTTISH-AMERICAN SOLDIERS. SERGEANT MAJOR JOHN McEWAN / CO. H. 65TH REGT. ILLINOIS VOL. INFANTRY. / WILLIAM L. DUFF / LT. COL. 2ND ILLINOIS REGT. OF ARTILLERY. / ROBERT STEEDMAN / CO. E. 5TH REGT. MAINE INFANTRY VOLUNTEERS. / JAMES WILKIE / CO. C. 1ST MICHIGAN CAVALRY. / ROBERT FERGUSON / CO. F. 57TH REGT. NEW YORK INFANTRY VOLUNTEERS.